OLD PARKED CARS. 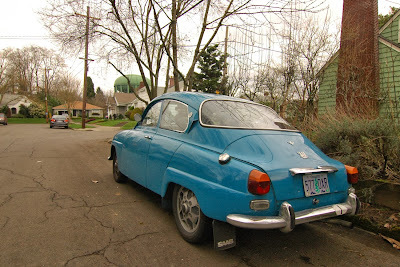 : Repainted and Revisited: 1968 Saab 96. 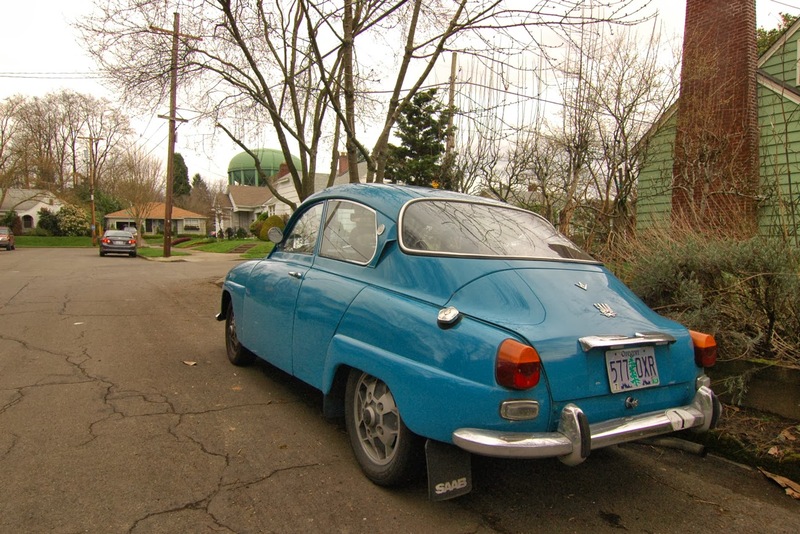 Repainted and Revisited: 1968 Saab 96. Last seen wearing lovely oxidation. beautiful paint. I love that profile shot, it brings out the strange shape even more than usual. Hahahahaa.... is that your personal car? 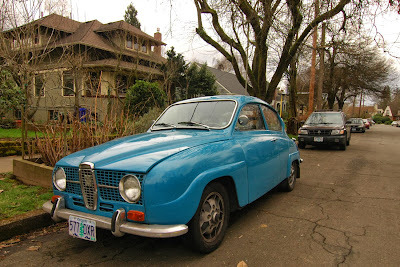 So funny I swore I would never buy another SAAB again but just came down to Portland to buy an '88 9K Turbo. I never owned a stroker but my friend in high school had a brilliant 99 EMS. Remember the Toad? Need to refresh the pictures but you get the point. 850 in the caption seems to refer to the old 2 stroke engines. However this car has a V4 badge on the trunk. 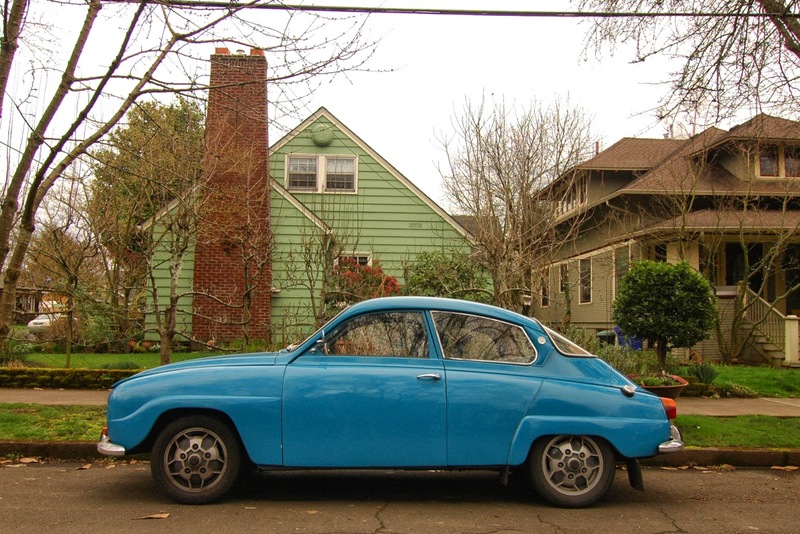 SAAB finally found out they should place the radiator in front of the engine and not at the back of the engine bay and that they needed a 4 stroke engine. To save money they bought V4 engines from European Ford. They also fit in the small engine bay. As I think I've posted before, there is or was a shop in town that set these up for rallying. I don't know if that means they're good, but it does make me want one. Always good to see another one on the front page of the blog. Even the later (long nose) 2 strokers had the radiator in the front. It's the short (bull nose) that had the rad behind the motor, along with floor hinged pedals and an American style speedo- Monte Carlos excluded. I agree with "anonymous". It´s a´68.Taller windscreen and back window give it away. The title should be changed. Really wanted one of these when they were new-ish. They definitely come across as quite quirky looking now. 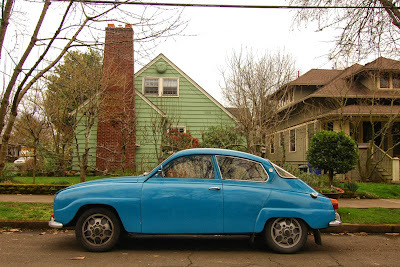 My astronomy teacher had the wagon (Saab 95 - never understood why the wagon version had a lower number than the sedan); it swallowed up a large telescope nicely. Also had a funny little rear facing third row seat!